isshoni: I've browsed SL for them and used the search function, but I haven't found any coverage of the invasions below. Do you know of SL pages that cover them? If not, would it be of interest to create them? Should they then be added to HolIgor struggles with the high extension (or else), or have (a) separate page(s)? If I decide to commit myself to create this content, since my understanding of the game is very limited, would posting the page on a BQM and asking additionnal questions and getting feedback from good players before master editing be a good way to proceed? Consider the Upper and Down sides as unrelated. 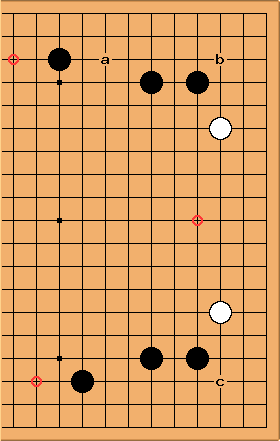 Additional White stones at circled points.